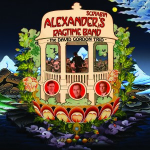 NEWS 1: Only a year after the event, we found out that Alexander Scriabin’s Ragtime Band was Mojo’s jazz CD of the year for 2016! NEWS 2: Very excited to be making our Italian debut with Rosario Bonaccorso, at Percfest, a long-running jazz festival that takes place in Laigueglia in Liguria on 14 June. David and Rosario met in Austria last year and hit it off straight away. Rosario’s CV reads like a Who’s Who of jazz and we are delighted to have the chance to tour with him. The new project the trio is embarking on is entitled Appartimento, in reference to partimento, the 18th century Italian method of music instruction, brought right up to date into the world of 21st century jazz improvisation. NEWS 3: And we’ve been featured for the three Sundays in May on jazzfm on David Freeman’s show. Featuring Yaron Stavi on bass, we played some tracks live in jazzfm’s studio, and chose tracks that had a connection with the blues to link to the vibe of the show. Also a little feature on BBC Radio 3’s Jazz Record Requests. Listen here, 51 minutes in. 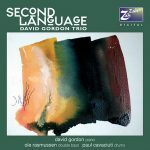 THE David Gordon Trio has a unique and individual sound world, a strong pedigree and a worldwide following. Their music is characterised by searingly beautiful melodies, free-flowing improvisation and quick-fire humour. All their recordings have received rave reviews in media in the US, Japan and Europe, where they have sold more than 10,000 CDs. The trio has played festivals, radio and clubs in Europe and the UK, also collaborated with a wide variety of artists, from singer Jacqui Dankworth and saxophonists Andy Sheppard and Jerry Underwood, guitarist John Etheridge to tap-dancer/vocalist Lucy Dixon. A prize-winning composer, David’s composition for the trio Angel Feet appears in Sher Music’s ‘The European Real Book’, and he was commissioned to write a work for the trio + London Chamber Orchestra, entitled ‘Inspired by Bach’. The piece was first performed to a sold-out Cadogan Hall in London in April 2013. NEW CD ‘ALEXANDER SCRIABIN’S RAGTIME BAND’ – available from mistersamrecords.com, and now on general distribution through Nova via Universal. The 14 tracks of the album celebrate the music of this great Russian piano-poet, mystic and synaesthete with jazz interpretations of some of his exquisite piano miniatures, alongside popular music from around the time of his death, in 1915. The result is that on one mind-blowing album, ambient rock, choro, doo-wop, tango and free-bop rub shoulders with the eponymous rag (which gets the makeover to end all makeovers), all infused with the wit and vibrancy characteristic of this remarkable trio. Splendidly recorded this is a consistently stimulating programme from a go-ahead and imaginative trio; they take care of the heritage of the music as well as summoning up something new minted. The trio’s sixth and latest recording, and most ambitious concept yet: Scriabin’s music, played trio style, in the context of music from around the year of Scriabin’s death, 1915.
sees the trio yet again in sparkling form. Released in 2013 on Nimbus Alliance Records, this CD takes a unique and personal look at music from South America, drawing both on popular music from that continent and songs which capture the revolutionary spirit of the 60s and 70s. ‘Standards’, including versions of Tico Tico and Quizas Quizas Quizas, played like never before, together with originals and Latin jazz tunes by Egberto Gismonti and Lyle Mays, make for a spicy feast for all lovers of jazz and Latin music. Review here. Sound clips here. Buy here. This, their fourth CD on ZahZah, finds the David Gordon Trio in greater telepathic contact than ever, playing their strongest material yet. Included on the album is their version of the already oft-recorded Greenland, the insouciant Second Language and their roof-raising hit Salsova. Aspects of Latin jazz rub shoulders with hints of gypsy and klezmer, a mantra from Tibet, a Finnish-Swedish folk song and a riotous version of Cole Porter’s What Is This Thing Called Love, all imbued with the trio’s usual transparency, polish and panache. A tour de force of contemporary European jazz, suitable for aficionados and new generations of jazz lovers alike. 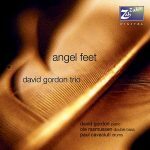 The third disc from the David Gordon Trio was the culmination of two years’ intensive work. The recording is a landmark in the trio’s development, and their particular style of jazz features Celtic, ‘acoustic groove’ and classical – even baroque – influences, and also includes the appearance of a tango and a rhumba. Read a review here. Or here! In trio playing, as in life, it’s necessary to emerge from the nursery and to mature. 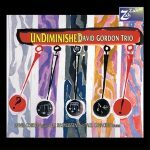 ‘Undiminished’, the follow-up, is the ambiguously-named title-track using much more of the language of contemporary jazz, and includes a last-minute experiement in adding to the already-rich texture. Interplay, odd-metre and experimenting with standards are all explored on this ever-popular recording. The result of an extraordinary day of recording at London’s famous AIR Studios. The trio re-creates the sparkle and clarity of its live performance in a mixture of original compositions and jazz standards, presenting a wonderful range of moods and contrasts. At one end of the spectrum the bright nursery rhyme quality of the opening track ‘Mister Sam’ to the lullaby elements of ‘Blue Pyrenees’, the poetry of ‘How Insensitive’ and the evergreen ‘Looking Up’. A thrilling debut album from this young trio.